About Me - Timothy Rene Alcoser J.R.
My name is Timothy Rene Alcoser Jr. I was born and raised in Southern California and have liv﻿ed here my entire life. I am a proud Marine Corps Veteran, full-time Public Servant, part time Sorority House Security Officer and I currently reside in beautiful Wrightwood, California. I have focused my education, training and goals in life primarily in the Law Enforcement and Security field and continue to learn and train in new ways to become better educated and skilled in this industry. Through school and personal experiences, I have obtained an above average understanding of Criminal and Constitutional Law. I love the Law Enforcement and Security because there is simply no better reward for me than to make people feel safe and help those who cannot help themselves. My best qualities are my high level of responsibility, maturity and unwavering loyalty and dedication to groups, companies or organizations that I represent or am a part of. I stand apart with my integrity and willingness to do the right thing, even when nobody is looking. I am ALWAYS willing to help someone in trouble or danger, even at the expense of my own safety and security. 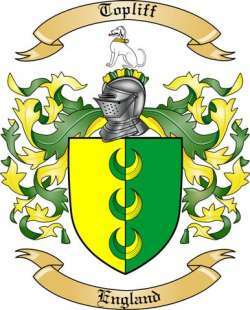 Below: The Topliff Family Crest from England (dating pre 1500), one of my many family lines.